DesktopAPI.com is the most affordable expired domain name software script offered today. Our program uses eNoms API and registers any domain name the instant it expires. DesktopAPI.com runs silently in the background on your desktop pc. The program continuously sends a check request to eNom and registers any TLD the second it becomes available for registration. All that is required to use the program is a reseller user id supplied by us or your own eNom reseller user id. The application supports .com, .net, .org, .biz, .info and .us. Simply use our online order page and we will email you the program upon receipt of your order. If you need to run the program on multiple PC's an additional license must be purchased for $20 per PC. Please see our affiliate program for further opportunities here. Looking for a unix server based name grabbing drop script try Dropscript.com. Looking for free pending delete name lists try Justdropped.com. Have you ever wondered how many domain names an individual or business owns? 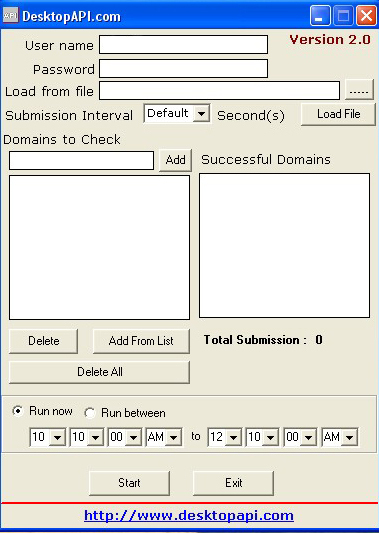 Try our name server tool located at: Dnslocator.com.